This blog post took longer than anticipated, partly because I put an offer on the place I saw on Wednesday afternoon. Long story short, they accepted, and I’m in the process of buying it. Hopefully the inspection will go a lot better than the first place I almost bought, but so far it looks a lot nicer. Being only a 4 minute drive from my current job is certainly a plus, especially considering I’m currently driving between 45 and 50 minutes each way pretty much every day. If this goes through, then after I get settled, I’ll finally be able to start catching up on reading and video games. I’ve got so much material already that I could easily stop spending money for a while and just focus on what I’ve already got. Anyway, let’s get on with this blog post. The first Avengers movie accomplished what seemed to be impossible. It brought together 6 superheroes, 4 of which enjoyed solo films before it. Compared to that, Avengers: Age of Ultron didn’t feel quite as impressive. In addition to the first movie’s Avengers cast, it gave a couple other pre-existing superheroes bit parts, brought in a couple brand new ones, and reduced the role of most supporting characters in favour of new ones. It’s still impressive that it happened mind you, but still. Captain America: Civil War feels like another movie that shouldn’t have been able to happen, and in more ways than one. First of all, this is the biggest ensemble of MCU superheroes yet. Sure, Thor and Hulk are both missing, and we’ll find out what they’re both up to in Thor: Ragnorok, but you’ve got the additions of Ant-Man and Spider-Man instead. Spider-Man in particular is an interesting one. Since the early 90’s, Sony held the movie license to Spider-Man, and they still hold that license. Considering Sony is a large and successful enough company that there’s no way Disney could buy them, and for the most part, their Spider-Man licensed projects have been successful and well-received, that makes things difficult. Disney and Sony started negotiating shared rights with Spider-Man after Amazing Spider-Man 2 was received very poorly, even if it was financially successful. For a while it seemed like Sony would keep the license, and were moving forward with six further Spider-Man related movies. However the 2014 Sony e-mail hacks revealed that Sony and Marvel were in negotiations for sharing movie rights. Those talks were believed to be halted, however in February 2015, they announced that they reached a licensing deal. Sony would continue to distribute solo Spider-Man movies, partly under Kevin Feige’s guidance, while Marvel could use Spider-Man in their larger team movies. These negotiations didn’t conclude soon enough to include Spider-Man in Age of Ultron like director Joss Whedon would have liked, but they happened soon enough for Ant-Man to reference Spider-Man. It was tight enough that there were two complete versions of the Civil War script. One with Spider-Man, and one without. Thankfully, they cast Spider-Man soon enough to include him in the movie. I’ll talk more about it in the upcoming Spider-Man: Homecoming post, but Tom Holland so far is a brilliant casting choice for a young Peter Parker. The other aspect that made Captain America: Civil War seem impossible is that it was based on an event that, well … let’s just call it polarizing. The Civil War event in the comics made some questionable choices with its story direction and character decisions. Taking that and turning it into a good movie would not be easy. Also managing to do that with a single movie, while at least exploring the basic motivations of everyone in the movie, would also not be easy. Furthermore, like Age of Ultron before it, Robert Downey Jr. hadn’t been locked down for this movie either. They needed a further alternate version of the script in case he wouldn’t sign onto another contract extension, one that wouldn’t involve the civil war at all. Everyone felt that if they were to adapt Civil War, they at least needed the two leaders from either side of the comic event. Writer Stephen McFeely said that the idea of a Civil War movie had been on and off the table for a while, and that his original plan, along with directors Anthony and Joe Russo, were first going for a “psychological thriller” to be an amalgam of The First Avenger and Winter Soldier. There’s a lot to talk about with the movie, so let’s skip the rest of its development cycle, as fascinating as some of the information is. I would honestly recommend that you look into the development further because of how much information there is out there. Since the Russo brothers had also been signed on to direct Avengers: Infinity War (then part 1 and part 2), directing Civil War was sort-of a test to see if they could handle an Avengers caliber movie. On the other hand, the San Francisco Chronicle said that apart from the opening action scene, the rest of the action in the movie falls flat. Uh … did that reviewer even watch the movie through, or did they happen to sleep during the airport sequence? Or the chase scene in these next two gifs for that matter. Civil War is also the MCU’s 4th billion dollar movie, earning $1.153 billion on a $230 million budget. That also makes it the fourth movie in a row featuring Iron Man to earn over $1 billion. That kind of track record is incredible any way you look at it. As for my own thoughts, where to begin? Civil War manages to be an Avengers caliber movie while still continuing the personal stories of Captain America, Iron Man, and the Winter Soldier. In the first movie, Steve Rogers is a straight up patriot. While he’s still a patriot in a sense, he clearly doesn’t like the way politics are moving. The events of Winter Soldier turned him off of excessive surveillance and control, and understandably so. After an Avengers mission ends with a disaster – hundreds of people killed – the world’s governments no longer want the Avengers to run free from oversight. It’s an understandable proposition, but also one that causes a lot of debate, both within the movie and in the real world. That’s how you know you’ve balanced your political movie well, when people can see both sides of the argument. At the same time, this movie manages to tell a psychological thriller involving Winter Soldier’s past, the manipulations he went through, and it digs deeper into how the Winter Soldier program controlled him. I won’t spoil the main villain in case you haven’t seen the movie yet, but the main villain is just a regular guy who manages to tear the Avengers team apart just by using information. That’s another fascinating aspect of this movie. It shows how dangerous information can be in this day and age. The right kind of information can straight up topple a government. Somehow, the movie juggles 12 superheroes and clearly states their opinions on this government oversight initiative. Of course Captain America and Iron Man are both given the most exploration on the matter, while also being the most outspoken advocates for their chosen sides. Black Widow is clearly conflicted on the matter, but chooses to try and regain the public’s trust. War Machine is all for signing up. Falcon … not so much. Scarlet Witch mostly chooses Captain America’s side because she feels like she’s being treated like a child by Iron Man’s side. Overall her character gets some great explorations in this movie, showing both her softer side and her rebellious nature. It’s shown that she’s at least somewhat afraid of her abilities, but is more afraid of feeling trapped. Ant-Man and Spider-Man are mostly in for helping a superhero they look up to, but that’s enough motivation for them. Frankly, only Hawkeye gets the short end of the stick here. He kind of just shows up with little warning, after supposedly being retired after Age of Ultron. Black Panther, played by Chadwick Bowsman is also effectively introduced. His basic set of beliefs is stated well, how focused and dangerous he can be is on full display. He also goes through a compelling character arc – potentially the most profound out of anyone in the movie. He comes out with what is quite possibly the deepest, most profound line of dialogue in the entire MCU so far. And of course, there’s Captain America. This movie does a great job at continuing his evolving view of the world. His devotion to freedom, honour and protecting the innocent hasn’t changed one bit from his “The First Avenger” days. What’s changed is the world around him. His refusal to back down from what he believes in changes him over the course of the trilogy. In the first movie, he’s a patriot. In the second movie, he’s really starting to doubt the direction the world is heading. By the end of this movie, he’s a straight up insurgent. That’s not to say he hasn’t changed at all – it’s just that he refuses to compromise on his moral compass. That’s a big part of why he’s such a great character. The big superhero showdown is both amazingly fun to watch and tragic at the same time. The fight scene is dynamic, using pretty much any combination you could imagine being fair. It’s got everything from Ant-Man pulling out wires from the inside of Iron Man’s suit to Spider-Man and Captain America having a friendly duel where they both clearly respect each other. Scarlet Witch is a beast in the scene, making up for the fact that most of the heavy hitters are on Iron Man’s side. But the final action scene is where the themes of the movie really hit home. There’s a major reveal that ties the Winter Soldier to Iron Man’s origin story, and then the superhero fight becomes entirely personal. As great as the fight scene is, it’s not entertaining, nor is it meant to be. It’s the darkest and most mature moment of the MCU, at least until Infinity War. It’s the breaking point that affects the entire MCU moving forward so far. It’s the reason why Iron Man and Captain America aren’t even on speaking terms when Infinity War takes place, two years later. Captain America: Civil War took a controversial event from the comics and improved on it in every way. 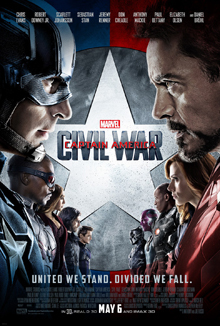 It acts as a solo film for both Captain America and Iron Man, while still succeeding as an Avengers film. In fact I’d go so far as to call Civil War the best Avengers film in the MCU yet. Infinity War comes close, except that it’s kind of only half of a movie. That’s not a knock against the first Avengers movie either – it’s still a great movie. Winter Soldier is still the best film in the MCU so far, but Civil War is really not that far off. The subject matter of the movie is very relevant today, and it manages to show a balanced viewpoint on oversight. That pretty much makes Civil War a must-watch. Next up is Doctor Strange, and that movie is a visual experience and a half. After that, it’s Guardians of the Galaxy Vol. 2, and I look forward to trying to figure out why it didn’t work quite as well as the first movie. Then it’s Spider-Man’s official MCU debut as a solo movie star. So far, the MCU’s third phase is very strong, even if there are a couple movies that are starting to feel a bit derivative. By the way, I have now seen Captain Marvel, but I’m not ready to share my thoughts on the movie. I’m still sorting them out in my head. But it feels like that’s going to be a longer than normal blog post when I do get to it. This entry was posted in comics, movie review, movies and tagged action thriller, ant man, anthony mackie, anthony russo, avengers, black panther, black widow, bucky barnes, captain america, captain america: civil war, chadwick boseman, chris evans, civil war, clint barton, don cheadle, elizabeth olson, falcon, hawkeye, iron man, james rhodes, jeremy renner, joseph russo, marvel cinematic universe, marvel civil war, marvel movies, marvel studios, mcu, mcu movies, movies, natasha romanova, paul rudd, peter parker, political thriller, psychological thriller, richard roeper, robert downey jr., rotten tomatoes, russo brothers, scarlet witch, Scarlett Johannsen, scott lang, sebastian stan, spider-man, steve rogers, superhero movies, t'challa, tom holland, tony stark, vision, wanda maximoff, war machine, winter soldier. Bookmark the permalink. To be fair, Winter Soldier is very hard to top. Civil War arguably came close, and I do think it’s the best team movie in the MCU so far, but Winter Soldier was and still is phenomenal. Captain America Civil War a fantastic and exciting film. It makes great use of its extensive cast, especially with the addition of Black Panther, Ant Man, and of course Spider-Man! This is a move all about a central conflict of ideals in the MCU, and the final showdown between Cap and Tony / Iron Man is all the more powerful for it. Civil War entertains and challenges us in equal measure, a great film! Judging by how Civil War and Infinity War turned out, Endgame should be amazing.